The BBC’s weekly The Boss series profiles different business leaders from around the world. 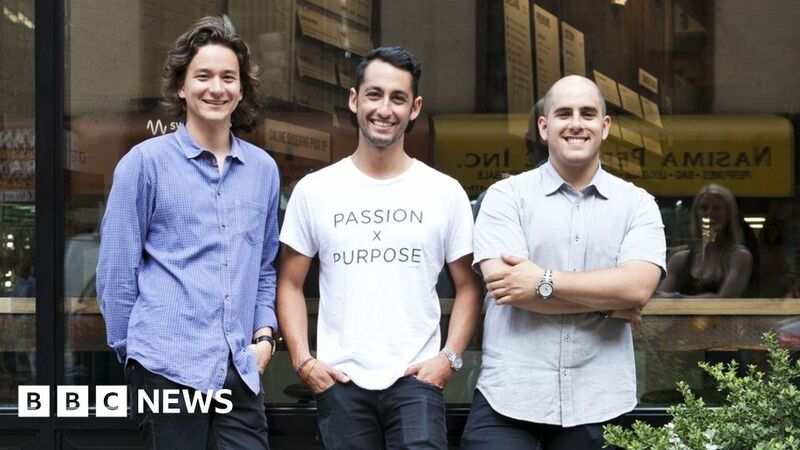 This week we speak to Nicolas Jammet and Jonathan Neman, co-founders of US salad bowl restaurant chain Sweetgreen. When three college friends couldn’t find healthy and affordable meals to buy in their neighbourhood of Washington DC they decided to solve the problem by opening their own restaurant. Thirteen years later, their business, Sweetgreen, is estimated to be worth more than $1bn (£780m). Looking back on their time as business students at Washington’s Georgetown University, Nicolas Jammet says that he, Jonathan Neman, and fellow co-founder Nathaniel Ru, had “nowhere to eat”. “The most delicious, accessible and popular food was generally the least healthy,” says Nicolas. Despite none of them having any experience of running restaurants, and yet to graduate, in October 2006 the then 22-year-olds started on their business plan in their college dormitory. Their idea was to set up a fast-food restaurant that only sold bowls of salad, both cold and warm ones, such as oven roasted vegetables. And instead of buying their produce from supermarkets or wholesalers, they would source directly from local farmers to ensure everything was as fresh as possible. By the summer of 2007, after they had graduated, the three friends had raised $300,000 (£233,000) from friends and family. In August of that year they opened the first Sweetgreen restaurant in an abandoned pub in the Georgetown area of the US capital. “We just kind of opened the doors,” says Nicolas, whose job title is chief concept officer. “We had hired a few students, but we hadn’t trained them that well. Jonathan, who is the chief executive, says that to begin with they had no plans to open more than the one restaurant. “We didn’t think it would turn into a career,” he says. But as the first branch grew in popularity, with daily lines of customers queuing down the street, the three friends realised they had created a business that was scalable. So they decided to focus all their attention on Sweetgreen, and open more branches. This required investment though, and it initially wasn’t very forthcoming. “For many years it was very hard to convince people to invest in Sweetgreen,” says Jonathan. “We had no track record, we were just kids from college. However, Sweetgreen’s healthy fast food eventually seduced high-profile entrepreneurs including Whole Foods boss Walter Robb, billionaire investor Steve Case, and French chef Daniel Boulud. After initially adding other outlets in Washington, Sweetgreen now has 90 branches across the US, and 20 more planned to open this year. With its headquarters having moved from Washington to Los Angeles in 2016, investment in the business now totals $365m (£285m), and it has more than 3,500 employees. While the company won’t reveal its annual turnover figure, Aaron Allen, an American restaurant consultant, says it is now estimated at about $120m. He says that Sweetgreen is very “on point” with what customers currently want. “There is an expansion towards healthier foods, which resonates very well with millennial demographics, but also others,” adds Mr Allen. Nicolas says that as the company continues to expand, it is committed to buying produce only from American farmers, despite this meaning that there will be certain months and years when some fruits and vegetables are unavailable. “We are at the mercy of Mother Nature,” he says. “One of our most popular salads is the peach salad. “But one year the US peach crop didn’t grow because of bad weather. At this point we could have bought peaches from South America and made our money, but we took a step back and thought, we buy our peaches because they are in season, and because they come from a particular region of the US, and from a particular farmer.